The longest owner/operators in the industry since 1999. 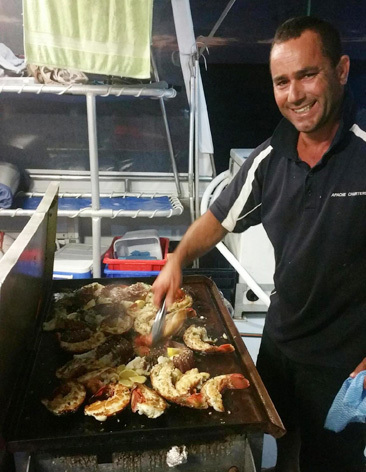 - WA’s Best Live aboard Charter. 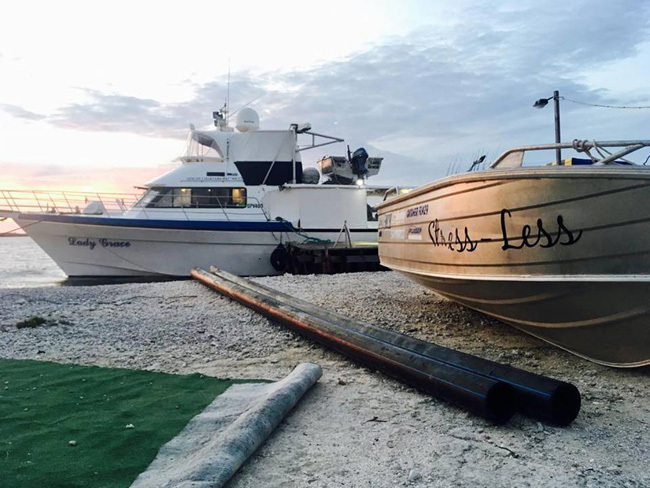 Let us show you the Abrolhos Islands on our live aboard all inclusive fishing & eco charters. Fishing for Dhufish, Baldies, Pink Snapper, Spangled Emperor and Spanish Mackerel. Pull cray pots everyday for fresh crayfish for dinner every night prepared by on our board chef. Explore the magnificent Abrolhos Island group 60kms off Geraldton made up of 122 individual islands on our 70ft fully equipped charter boat Lady Grace. Arrive Geraldton marina and board vessel at 5pm on Sunday to load your gear. 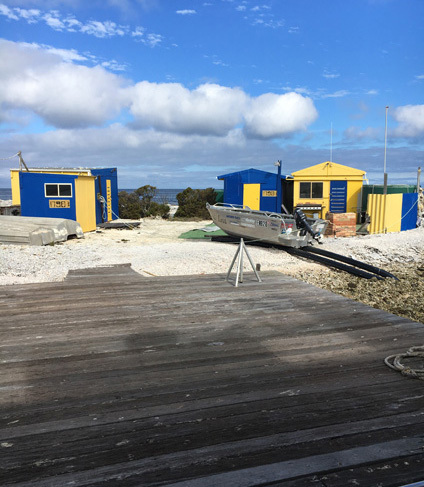 Overnight accommodation is supplied complimentary tonight in order to depart for the Abrolhos islands early Monday morning. Dinner is not provided tonight, we recommend you head to the restaurants nearby. 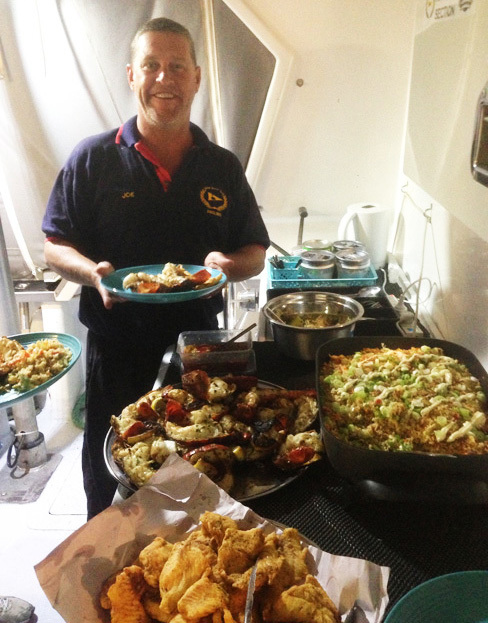 Departing Geraldton Marina , breakfast is served en route to the Pelsart or Southern Group of the Abrolhos. It normally takes about 3 hours to reach the southern end of the Pelsart group where we start trolling the area of Wreck Point for Spanish Mackeral and Tuna. From there we fish our way around the western side of the Pelsart group bottom fishing for Dhufish, BaldChin Grouper, Pink Snapper and Coral Trout. Time to pull the daily cray pots , you can add fresh crays to the dinner menu tonight. If you can reel yourself away, lunch is served. After a hard days fishing we steam into the island group and anchor in a well protected spot where the water is crystal clear and the marine life abundant. While your relaxing having a few beers or flicking a line, the cook will be preparing your meals. If you can reel yourself away, lunch is served. After a hard days fishing we steam into the island group and anchor in a well protected spot where the water is crystal clear and the marine life abundant. While your relaxing having a few beers or flicking a line, the cook will be preparing your meals . Yep more of the same, fishing, fishing fishing, crayfishing, eating, drinking, fishing, fishing, fishing. After another big breakfast its another day of fish, fish, fish and more fish, bottom bouncing, trolling or jigging with some soft plastics the choice is yours. Cray pots are again pulled and reset for tomorrow. Yet another day of fishing and great times ahead. 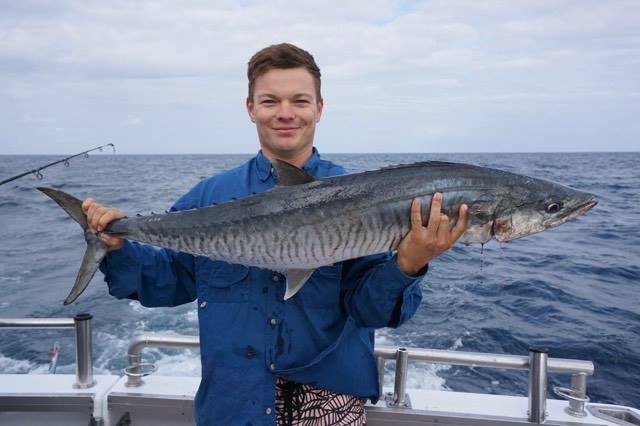 We take you out wide chasing great bot-tom fish or if you like we can also chase big pelagic species like Marlin and don't forget to pull the pots so we can throw another cray on the Barbie. If you have opted for the 4 day trip, late in the afternoon we arrive back in Geraldton. Stay on board tonight and leave the Lady Grace by 8am in the morning for your return home. Dinner is not provided on the last night, we suggest you head to the nearest watering hole. 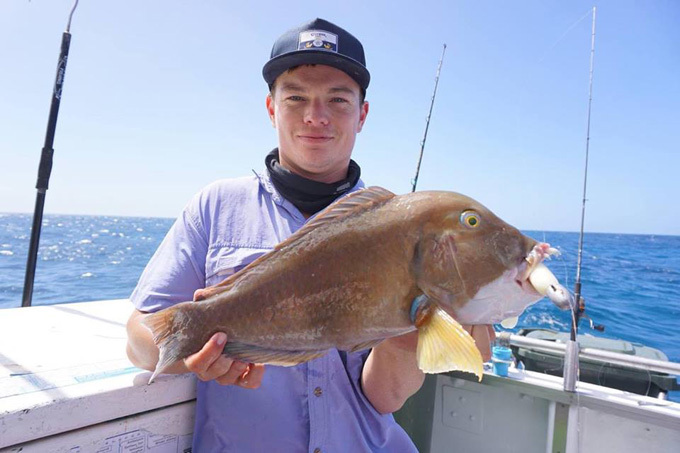 Day 5 - Friday (if you have booked a 5 day trip) Lucky you, , so today is still all about fishing the Abrolhos. 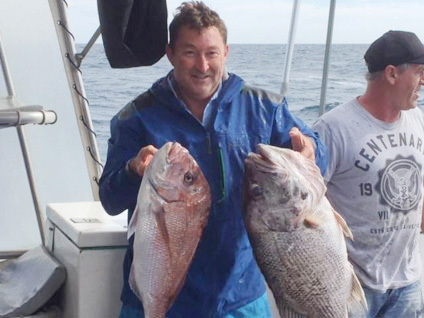 Fish for most of the day before heading back to Geraldton, . Stay on board tonight and leave the Lady Grace by 8am in the morning for your return home. Dinner is not provided on the last night, we suggest you head to the nearest watering hole. Sleeping bag, pillow, single sheet, personal toiletries, towel, alcohol, bottled water if preferred, soft drinks, snacks (i.e. lollies, chips, chocolate if needed.) Please also bring along an esky and leave it in your car for when the charter has finished for your fish. Hot Cooked Breakfast - is varied but consists of a selection of the following bacon ,eggs, sausages, baked beans, tinned spaghetti , toast and cereal. Morning tea of Fruit cake and biscuits tea and coffee. Lunch - is wraps and or sandwiches which a large selection of cold meats and salads. Dinner - is also varied but consists of mainly fresh fish, crumbed fish, battered fish,steak night, Chicken Thai Curry, Pasta, Salads, Crayfish(seasonal), Hot chips and Vegetables . Quality fishing gear supplied like Finor 650 spooled with 50 pound braid for bottom fishing and Shimano Tiagra trolling reels. We supply trolling lures and bait. All fish is filleted daily by our crew, wrapped in plastic fish bags and are then snap frozen in our on board commercial freezers. At the end of the trip, all fillets are then packed into your eskies. 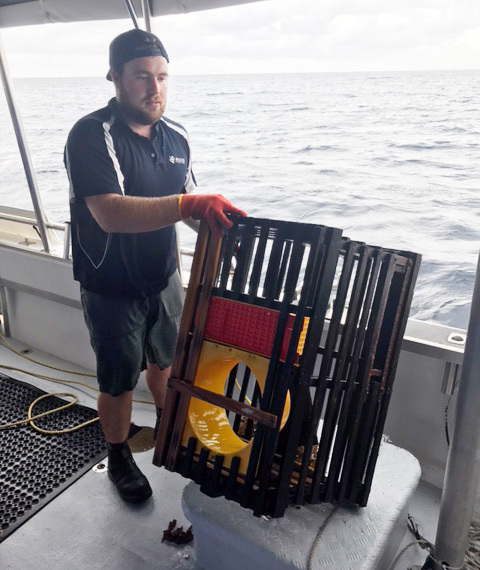 All fish is filleted and wrapped into freezer bags and frozen on board by our crew.